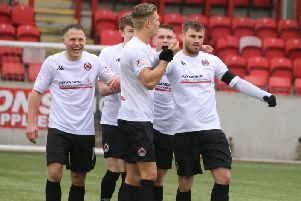 Kilsyth maintained their place at the top of the Super League First Division table after a hard-fought 1-1 draw against Yoker Athletic at Duncansfield on Saturday. The match could have gone either way but at the finish both sides should be reasonably happy with their point. Both teams started in an attacking mood with the visitors having probably just a litle more of the pressure early on. Both had free-kick awards in good positions; Corey Pearson put his over the bar, Yoker’s was cleared after a scramble. After just 17 minutes Rangers’s David McWilliams went off after taking a knock, to be replaced by trialist Sinclair. He was only on the field for a short time before he won a free-kick and, taking it himself, he sent a cracking low shot through the defenders’ wall to give Rangers the lead. Yoker responded with a period of sustained attack with no end result and might have felt slightly agrieved to go in a goal behind at half-time. Nicky Prentice broke away and had the ball in the net but adjudged to be offside, though few home fans agreed with the verdict. Then, at the other end, the ball was cleared off the line, or more probably from just over the line. No goal was indicated by the referee or his assistant and this Yoker fans disagreed with the decision. Yoker then brought on Arbuckle, and he made the difference almost straight away; he took a good pass from Maxwell and placed the ball past Duke. Rangers brought on Scott Davidson quite late on and well into added time had a final chance to get all three points. From a free-kick a mighty scramble took place in the Yoker goalmouth, the keeper had two point blank saves and eventually the ball was cleared.